Curl – Stylish Barber Shop Joomla Template will help you to make your web platform gorgeous. Dark colors, big and sharp photos, contrasting elements – this design will not only attract visitor’s attention but also make him feel the desire to get a haircut in your salon. The template has a reservation block, so it will be easy to contact you for your clients and convenient social media sharing options to tell about you in their accounts timelines. Nail Bar – Nail Salon Joomla Template is a solution that meets those requirements perfectly. It has a number of functionalities that can help you in the everyday business maintenance, such as a marvelous gallery for examples of your work and an appointment form to make clients registration easier for you. Pricing table and testimonials module improve the level of visitors trust and could affect the decision to choose your salon. The design is simple but attractive. It is generally light and leaves a feeling of wide space. ET SPA – FREE & PREMIUM SPA JOOMLA TEMPLATE is Responsive Beauty and Spa Joomla template that targets for beauty salon websites. Spa Website Templates build with latest Bootstrap CSS Framework, Support Font Awesome and K2 extended style. With style options like advanced theme options and alternative module layouts, you have control over the look of your website. Besides, it comes with 4 color schemes helping to create excellent websites with various layouts. You can alter style aspects like coloring to tie your website to an existing brand which identities for a professional appearance. 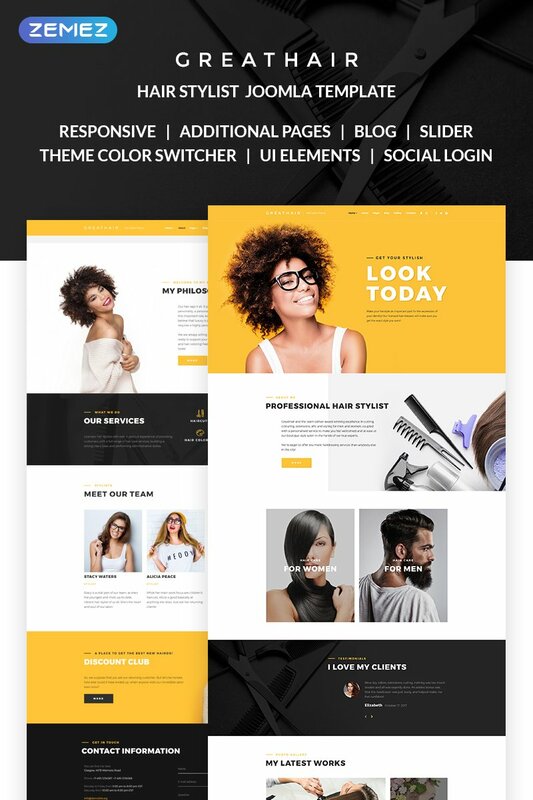 Greathair – Fancy Hair Stylist Joomla Template looks just like a hair stylist website supposed to look. It doesn’t matter if it is a personal stylist portfolio website or a hair salon page, Greathair will fit everyone. Just look at the breathtaking gallery layout! It highlights the beauty of photos, so your works will make your visitors feel the desire to change their style. The template is easy to install and use, the detailed documentation makes any re-shaping easy as cake. ET BARBER – FREE & PREMIUM HAIR SALON JOOMLA! TEMPLATE is a responsive Barber Website Template which is right matched for hair salon or barber websites. Its framework comes with Page Builder for layout, Shortcode for editing content and performing products smoothly, Support Font Awesome, Compress files and so on. The designs are impressive and elegant, attracting viewers into browsing your entire site. Furthermore, it comes with 4 color schemes helping to create excellent websites with various layouts. It is compatible across browsers and devices too so that patrons can view your page and even book appointments from their mobile or tablet device. TD GOZEEN – FREE JOOMLA! TEMPLATE is a Multipurpose Joomla template based on Bootstrap framework, the Bootstrap Framework makes it fully responsive to all screen resolutions and aspect ratios. The template comes with 6 predefined color styles red, blue, green, yellow, brown and purple Background color and pattern change from template parameters page. LT NAIL – JOOMLA SALON TEMPLATE is a good-looking Template which is intended for hair salon, nail salon or beauty salon website design. Joomla Salon Template is the perfect solution to all of your needs, offering you the opportunity to spread the word about your services, increase your client base and create a web presence that is truly impressive. The template framework comes with Page Builder for layout, Shortcode for present content easily, Support Font Awesome, Compress files and so on. JD Dallas is another feature rich business Joomla 3.7 template. This highly customizable Joomla template is powered by Helix Framework (Helix won the J.O.S.C.A.R for the best Joomla template systems.) and built with SP Page Builder Pro (You are saving $49) which helps you to develop pages by just drag and drop element. It makes easy to create page even you don’t have any coding skills. JD Dallas is ideally suited for the website of agency, studio, startup or personal page of the designer, developer, photographer, freelancer, etc. JD Dallas comes with Smart Slider 3 Pro so you can save $25 and can create a beautiful responsive slider and other sliding elements on the page. LT Surgery is Responsive Plastic Surgery Joomla template. This is web masterpiece which is perfect to plastic surgery center. It’ll help you earn a lot of profitable business but only when people know you exist and talk about your services. Plastic surgery is an area that focuses on aesthetics which is why all our layouts have a powerful visual impact. Everything is placed carefully, and all the elements combine harmoniously creating a relaxing and safe atmosphere. This design can be implemented easily, without the need of any external help. JD OHIO is a light-weight Joomla template compatible with the latest version of Joomla. It is built with the Powerful Helix framework – with powerful features and ease of customization. JD OHIO is a modern Joomla template which provides the user with a lot of user-friendly interfaces and a lot of options to customize your site. JD OHIO is responsive business Joomla template which is well suited for Agency, Studio, Corporate, and Business websites. This template is sure to catch the eye of the viewer with an attractive set of layout options and features like sliding images and other important details. LT Strategy is premium Joomla template tailored for business or creative websites. This is professional template to convey your company’s products and services by providing an effective design to make viewers get interested in your business at first sight. LT Strategy builds on strong framework with fully bootstrap under 100% responsive layout (support for mobile devices), powerful shortcodes, unlimited position and easy to drag-drop layout content. Furthermore, it comes with 4 color schemes helping to create excellent websites with various layouts. LT Spa is responsive business for spa website. This is gorgeous template used for health, beauty and relaxation websites to showcase and promote your spa center, besides, provide detailed information about its beaty services, staffs & managers, pricing tables. LT Spa builds on powerful framework with 100% responsive layout (support for mobile devices) based on fully bootstrap, unlimited module position, strong shortcodes help you present content easily. Moreover, it comes with 4 color styles, has drag-drop tools and color settings helping to create wonderful websites with various layouts.